Seventeen year old Nancy Drew, girl detective has a new life in a new town. However, when a mysterious, threatening note arrives she is drawn back to her home town of Bayport. There she is reunited with her old friends, Bess and George, and with Joe and Frank, aka the Hardy Boys. The old gang team up to investigate once more and find out who is out to get Nancy. 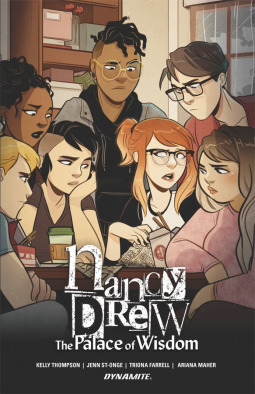 This new comic series, written by Kelly Thompson (of Jem and the Holograms and Hawkeye: Kate Bishop) and illustrated by Jenn St. Onge (of Jem and the Misfits), is a little different from the old Nancy Drew books you might remember. It's a bit more modern and the characters are a little older. Having Nancy go back to her hometown is a nice device that lets older readers feel like they're coming back to Nancy Drew and her stories as an adult too. Along the same lines, there is a flashback in which Nancy and her friends' adventure to try and find lost pirate treasure is interrupted by the news of her mother's sudden death, spelling the end of childish fancies for a while, but not forever. I enjoyed the art, which largely avoids unnecessarily sexualising teenagers (with the exception of some of the cover art and Nancy's Halloween costume, which is fairly mild as far as these things go). It features characters with a range of body types, as Jem does. Also, like Jem, this series features a lesbian relationship, between George (now with a cool new haircut) and her girlfriend Dannika. This series brings a new love interest for Nancy, too, in the form of Pete, the half black, half Mexican boy who gets sucked into helping solve the mystery. Nancy Drew: The Palace of Wisdom collects issues 1- 5 of the series. I wasn't a huge fan of the books as a child, so I don't know if people who are a bit more invested in them would see this comic series as a travesty, but for my money, it was fresh and fun, and well worth a read. Disclaimer: I was given a complimentary e-galley of this book by Diamond Book Distributors, via NetGalley, in exchange for an honest review.